Victoria’s Gippsland stunning natural sanctuary spoils even the most dedicated city-slicker with its sheer abundance of natural beauty. Heading east, with the Melbourne skyline in your rearview mirror, the land ahead of you begins to unfold. Making your way through impossibly green hills that seem to roll on endlessly, you breathe out and feel the country calm wash over you. This is Gippsland. East of Melbourne, and reaching all the way to the NSW border, the Gippsland region is vast and diverse. 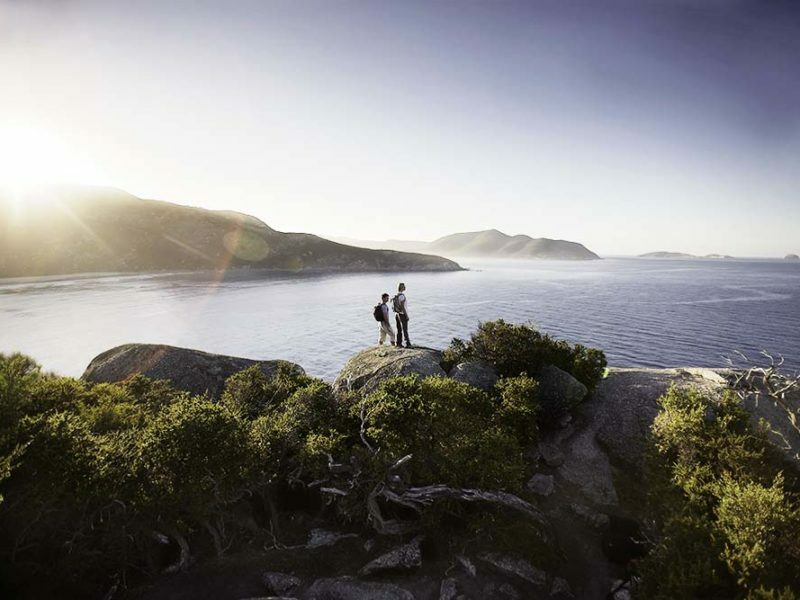 The first thing you will notice is the changing landscapes, like a wondrous choose-your-own-adventure story that takes you from the snow-capped Victorian Alps to grassy plains and bushland; mighty mountain rivers and pounding waterfalls to shimmering lakes and pristine beaches. The enviable line-up of national parks is the playground of walkers, mountain bike riders and cyclists, paddlers and campers. In the natural sanctuary of Gippsland, you could be excused for thinking that Mother Nature is just plain showing off. Hanging its hat on over 500 kilometres of coastline, the largest inland waterway in Australia and many mountain rivers, Gippsland is unsurprisingly a water-lover’s paradise, offering fishing or boating, surfing or swimming, by canoe or sail. There are waves that gently lap at your feet and giant ocean swells; mighty river torrents and lakes so still it’s impossible to make out where reality ends and the reflection begins. Mother Nature is awe inspiring, but she is also a provider. Some of the best produce in Australia is grown, raised and made on this fertile patch of earth: the creamiest milk and world-class cheese, succulent beef and famous prawns, tangy berries, crisp apples and the freshest of fresh vegetables that are packed full of flavour. The secret’s out about the rainfall-rich soil producing beautifully balanced cool-climate wines, too, with winemakers flocking here, along with a new wave of brewers and distillers. Many a savvy restaurateur has championed the region’s exceptional produce in their menus, showcasing seasonal deliciousness and supporting local. Some of the nation’s top chefs have followed the call of a simpler way of life, opening restaurants and cafes that feature quality Gippsland produce and hero its rich and honest flavours. Gippsland is dotted with towns full of character and welcoming folk who truly love where they live. Townships – situated by wood, hill and sea – are full of life fed by quirky festivals and vibrant farmers’ markets, connected by farm gates, produce and wine trails, and glorious country roads. Travel the region and you start to get the picture of a land that has been smiled upon by the Mother Nature and winked at by the food gods. This is Gippsland. Dip a toe in the water and hire kayaks or stand-up paddleboards for the day, or go the whole hog and charter a yacht or cruiser. This spectacular system of lakes is best enjoyed spotting dolphins at play over the bow of your kayak or casting a line from the deck of a yacht. This rather extraordinary cool-climate rainforest is one of the last of its kind in Victoria. Explore lush gullies and fern glades, and cross the graceful suspension bridge, all the while dwarfed by enormous ferns and towering mountain ash. Stop for a while, breathe in and hug a tree. You’ll feel better for it. This special piece of earth is the southern tip of the Australian mainland, where squeaky, white sands meet turquoise waters, and bushland and clifftop walks showcase unbeatable views. You can set out for a self-guided walk, or take the lead from someone in the know, and travel with a local. The wildlife here has an abundance of representatives from Aussie’s Big Six: echidnas, koalas, wombats, kangaroos, wallabies and emus. You can also get a fresh perspective of The Prom on a cruise, taking you to little-known parts of this natural haven. View dolphins and a seal colony and, if the season’s right, even whales can make an appearance out there in the big blue. Effortlessly glide (or wobble) your way through spectacular scenery. This network of rail trails takes in grassy plains, seaside views, native bush and scenic trestle bridges. The trails are pleasantly punctuated by pit stops formed by quality restaurants and cafes, so slow down and take the time to enjoy a ride with the family. Detour off the main roads to take in the dramatic peaks of Gippsland’s High Country, a region peppered with delightful villages such as Walhalla and the rustic Dargo. Walhalla’s present beauty provides a fascinating contrast to the challenges of its gold rush yesteryear. The Great Alpine Road weaves you through stunning bushland and, during spring, the alpine heath covered in wildflowers.